Business and medical professionals rely on large data sets to identify trends or other knowledge that can be gleaned from the collection of it. New technologies concentrate on data’s management, but do not facilitate users’ extraction of meaningful outcomes. 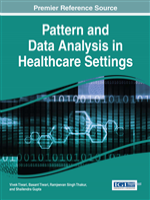 Pattern and Data Analysis in Healthcare Settings investigates the approaches to shift computing from analysis on-demand to knowledge on-demand. By providing innovative tactics to apply data and pattern analysis, these practices are optimized into pragmatic sources of knowledge for healthcare professionals. This publication is an exhaustive source for policy makers, developers, business professionals, healthcare providers, and graduate students concerned with data retrieval and analysis.